WONDER WOMAN™ features detailed, brightly colored, 360-degree artwork. 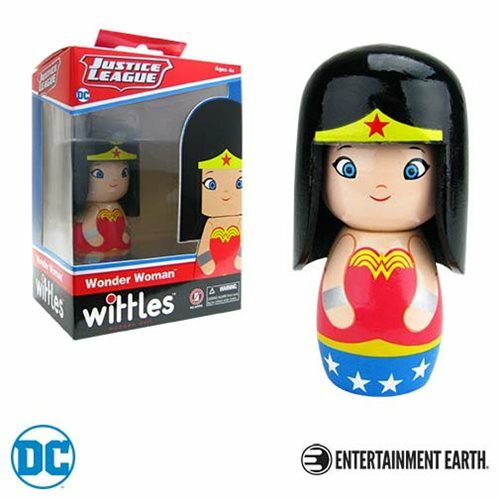 Inspired by traditional handmade Japanese wooden kokeshi dolls, this super-cute and collectible Wonder Woman Wittles™ Wooden Doll presents the AMAZON WARRIOR PRINCESS™ in her iconic star-spangled costume, complete with tiara and magic bullet-deflecting bracelets. Measuring about 4-inches tall, the non-articulated figure features detailed, brightly colored, 360-degree artwork, so she looks WONDER-ful from any angle! Ages 4 and up.